Old World Galleries in downtown Boone. In today’s fast-paced world of instant gratification, some things just aren’t made with the same quality and care that they used to be. That’s why Charlie and Joy Travis of Old World Galleries have made it their mission to bring back the fine art period of jewelry making. 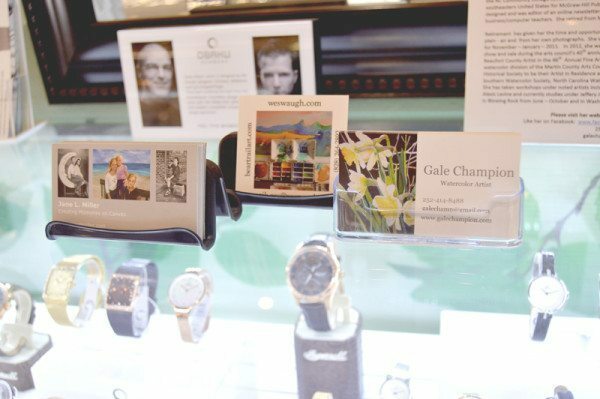 The owners are joined by fine jewelry experts and staff members Jennie Trivette, who has served the needs of discerning jewelry buyers in the area for many years, and Morgan Shaw, who has been making jewelry for 40 years. These professionals aim to provide the best possible service, which includes meticulous attention to detail, creative consultation and the matchless experience of a one-on-one, face-to-face design process. The studio operated in Blowing Rock for more than two decades before relocating to its current storefront at 697 West King St. Step into the downtown Boone gallery today and you’ll enter a world of creativity, quality and care, where old and new things meet in a beautiful and interesting way. No shopping experience at OWG is complete without meeting the couple’s two standard poodles — Ozzie, 9, and Boone, 1 — who are often the first faces you’ll see behind the counter. Boone, the Travis family’s 1-year-old Standard Poodle, stands at attention, ready to meet the next customer who walks through the door at Old World Galleries. Photo by Jessica Isaacs. The professionals at Old World Galleries offer a variety of new and antique, vintage and estate pieces. They also specialize in restoring antique jewelry and building completely custom, modern pieces, many of which are created in the styles that were popular during the Art Nouveau and Art Deco periods. Jennie Trivette, Charlie Travis and Joy Travis are pictured with Boone the Standard Poodle behind the counter at Old World Galleries. Photo by Jessica Isaacs. These high art eras of jewelry making are often the inspiration for custom-created pieces at Old World Galleries, like an engagement ring that Charlie recently developed using a 1930s diamond and modern technology, which resulted in a one-of-a-kind family heirloom for the client. The gallery also features and offers for sale work from three local painters. “We have Wes Waugh, who is from North Carolina and has lived in the area for about 35 years. He loves to paint watercolors and uses brilliant colors very effectively,” Charlie said. “We have Jane Miller, also a North Carolina native, who lives on Beech Mountain. She uses oils and concentrates on portraits, primarily. She does commissioned work for clients, as well as painting portraits of the people and the dogs that she loves. Inside Old World Galleries in Boone. Photo by Jessica Isaacs. Whether you’re looking for something brand new, something antique, something custom or something in between, the team at Old World Galleries will be ready and waiting with plenty of options for you. Stop by their shop on King Street and rest assured that tender love and care have been invested in every piece you see. OWG operates from 10 a.m. to 5 p.m. Tuesday through Saturday and appointments are not necessary for interested clients. Give them a call at 828-264-6559 or check out oldworldgalleries.com for more information. Old World Galleries is a member of the High South Event Professionals network — a community of like-minded industry pros who work together to promote the mountains of western North Carolina, eastern Tennessee and southwestern Virginia as the premier special events destination in the Southeast. Meet the OWG team and other preferred local vendors at the High South Wedding Expo at the Boone Mall on Sunday, March 20. Three stone center set sapphire with old mine cut diamond side stones set in 18K white gold. OWG helped create a new mounting for this diamond, which now features a diamond criss cross shank with a diamond halo and front and back diamond bands, as well as a trip of sapphires on each side for accent. Cameo brooch garnished with 10K yellow gold. Italian hand-carved shell cameo in 18K yellow gold with a hinged pendant ball and pin. OWG’s Morgan Shaw revitalized this men’s tiger’s eye ring, restoring its intricate details and breathing life back into this family heirloom for the client.